At the Eaton Chelsea, that might mean working on craft projects or playing games in the “Kid Centre,” splashing in the indoor pool and swooshing down its 130-foot (40-meter) water slide, or (for older kids) hanging out in the Teen Lounge playing video games or watching movies. During March school vacation and throughout the summer, the hotel offers additional programs for kids and families. Camp Chelsea is the hotel’s day camp program, designed for children between five and 12. Bingo nights, movies, and other family programs keep everyone entertained. 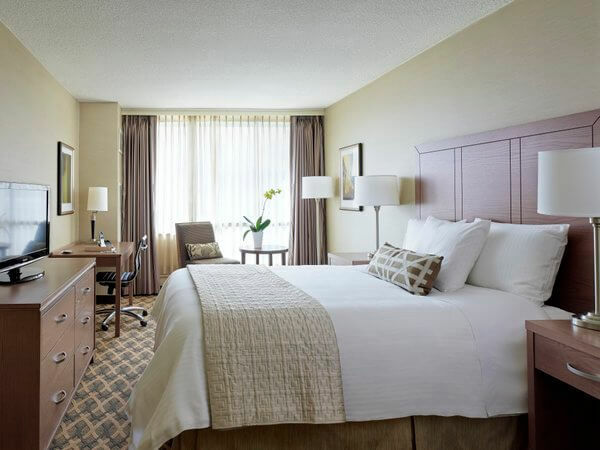 With nearly 1,600 guest rooms in two towers, the Eaton Chelsea is Canada’s largest hotel, with accommodations ranging from small standard rooms to expansive family-friendly suites. Although the entry-level Chelsea rooms measure just 275 square feet (25 square meters), they’ve got all the mid-range hotel amenities: white duvets, flat-screen TVs, coffeemakers, and (hurray!) free Wi-Fi. Moving up the price scale, you might opt for a somewhat larger Deluxe room (averaging 315 square feet) or a studio unit with a kitchenette, handy when the little ones get the early morning munchies. 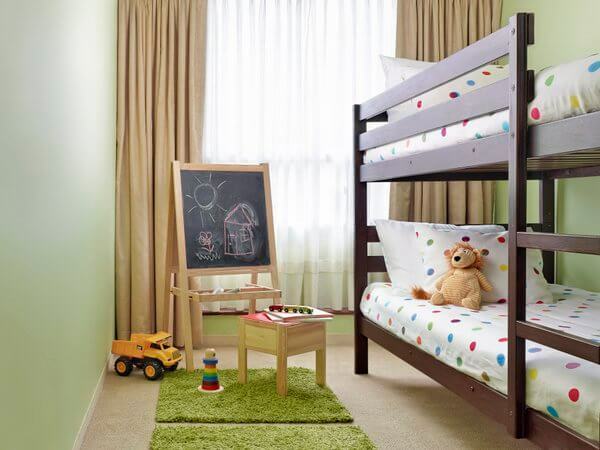 The best rooms for kids are the two-bedroom “Family Fun” suites, where one of the bedrooms has bunk beds and a play area. The Eaton Chelsea has an additional large-scale room renovation in the works, encompassing 750 guestrooms in the property’s north tower. It’s slated for completion by April 2015. Although the Eaton Chelsea courts families, adults aren’t neglected, particularly with the recreational facilities. The hotel has an adults-only indoor pool up on the 27th floor. The health club, too, is restricted to ages 19 and up. 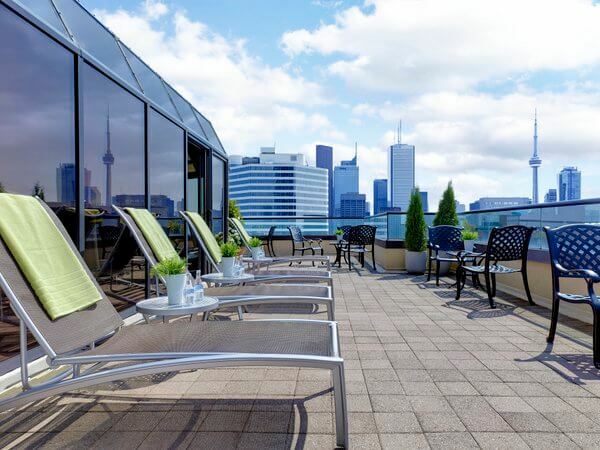 And the adjacent outdoor sundeck is a peaceful perch for enjoying the skyline views. Because the hotel is so large, the lobby can feel like a commuter train station at rush hour, and waits for check-in, or for the elevators, can be longer than you might like. You also need to pay attention to which elevator goes to your tower and floor, since different elevator banks serve different areas of the hotel — not a problem, just something to note. If you’ve brought a car, budget $29/day for self-parking and $39/day for valet service. You don’t need a car, though, to explore Toronto’s attractions from the Eaton Chelsea’s downtown location. It’s a couple of blocks from the College subway station, and just steps from the shops and restaurants along Yonge Street. It’s also a short walk to the massive Eaton Centre mall and to the theatres near Dundas Square. With kids in tow, you probably wouldn’t want to walk to attractions like the CN Tower, Ripley’s Aquarium of Canada, or the Royal Ontario Museum, but the city transit system can get you to any of these locales by subway or streetcar. Standard room rates start at about CAD$169/night for a double room, and kids under 17 stay free. Suites start around CAD$285/night. If you’re planning a family trip to Toronto, check the hotel’s website for discounts and packages. Then have fun with the kids at the Eaton Chelsea, Toronto’s most family-friendly hotel. Book online with Priceline, or Hotels.com. Hotel review by Vancouver-based travel, food, and feature writer Carolyn B. Heller, author of the books, Moon Handbooks: Ontario and Living Abroad in Canada. Photos courtesy of the Eaton Chelsea Hotel, which also hosted my stay for review purposes.